Date: Tuesday, 9 January Kick-off: 19:45 GMT Venue: Etihad Stadium Coverage: Live commentary on BBC Radio 5 live & BBC local radio; live text coverage on the BBC Sport website and app. 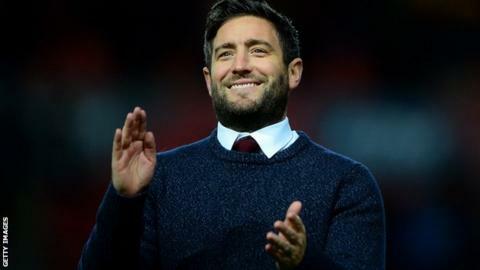 As Lee Johnson's Bristol City lost a club-record eighth straight league game in front of 'Johnson out' banners in January 2017, the idea of him avoiding the sack was, to some, even more far-fetched than the Robins dumping Manchester United out of the cup. Just 12 months, one death threat, one relegation battle and four impressive wins over top-flight sides later, he will lead Bristol City into their first major semi-final for 29 years against Premier League leaders Manchester City on Tuesday. So how did the 36-year-old go from calls to be sacked - twice in his career - to be heralded as one of England's finest young coaches? "We went through that together, as a fanbase, a playing staff and a coaching staff," said Johnson following his side's quarter-final victory over United in December. "It definitely made the players stronger and I'd like to think that I'm a stronger and better manager because of it. "The important thing was that we did come through it. This makes all that worthwhile. Those [tough times] are part of life. "The owner has always backed his managers - there's probably not a better owner you could work for. He stood firm when the pressure cranked up." So why did owner Steve Lansdown give Johnson his full support last January, despite a gloomy run of 13 league defeats in 16? "That decision - not just made by me but by the rest of the board - was the right one and has been proved to be right," the businessman told BBC Radio Bristol. "What I said at the time was we had something really special going on here, that everybody was behind, and we're seeing the results of that now with the way the young lads are coming through. "I'm immensely proud of what Lee has done. We finished last season well and the fans have now come around. "In the summer, Lee did an awful lot of work and soul-searching in terms of how he wanted the team to move forward. It's all come together." Further defying the modern era's frequent "hire and fire" culture within football, Bristol City's board were in fact not the first to stand by Johnson during seemingly difficult times. In his previous managerial job at Barnsley, Johnson endured another run of eight successive league losses, equalling the Tykes' club record in November 2015, before turning things around. During that streak came a humiliating FA Cup first-round loss at non-league Altrincham, but former Barnsley chairman Maurice Watkins firmly believed in Johnson. "I do remember having a long chat with Lee after the game as we walked down the touchline," Watkins told BBC Sport. "But we believed he was the right person to take the team forward and we did start to turn the corner not long after that. "Lee was always prepared to listen. He shared a lot of our particular interests, wanting to promote young players at the club, and I've got very good memories of working with him." Johnson went on to guide Barnsley to a Wembley final, leading them to victory in the EFL Trophy semi-finals before joining Bristol City - a club for whom he made nearly 200 appearances as a midfielder. But his potential had already been spotted long before his time with former Manchester United director Watkins at Oakwell - in March 2013, aged 31, he became the English Football League's youngest manager at that time when he took charge of Oldham Athletic. Boosted by a personal recommendation from Liverpool legend Kenny Dalglish to Latics chairman Simon Corney, a fresh-faced Johnson met then-Oldham chief executive Neil Joy. "You could immediately see that he was on a different level to any coach or manager that I'd worked with before," Joy - now chief executive at National League AFC Fylde - told BBC Sport. "In terms of his presentation and the level of analysis he went into, it was clear that had a burning desire for a career as a top-level football coach. "He clearly has that something a little extra, and that'll probably take him to the very top of the game in my opinion. "The gamble with Lee was a major one because it was his first managerial job. It was a considerable risk but we felt it was a risk worth taking, and it proved to be the case. "He had analysed our players, our games and players he had identified to sign. "He pretty forthrightly said 'there is a player out there who I'd take tomorrow and I'll give it to you for free even if you don't appoint me as manager' and that was Korey Smith. We took Korey and he was excellent for Oldham." Johnson would go on to recommend Smith, 26, to Bristol City - a move which, years later, led to December's dramatic quarter-final winner against Manchester United. With Bristol City fourth in the Championship, praise had already been launched Johnson's way long before his side crafted a 2-1 win over United. But that night encapsulated the club's progress under Johnson, as academy product Joe Bryan's rocket into the top corner opened the scoring before Smith's stoppage-time winner fired them in to the last four. However, it is not just beating Old Trafford counterpart Jose Mourinho that has thrust Johnson into the limelight. Known to use drone footage to analyse training, Johnson's passion for innovative coaching techniques with the aid of modern technology means he has asked for the installation of big screens at the training ground to play back drills live. He also appears to manage the theatre of a pre-match news conference well too, recently grabbing additional headlines by revealing he had bought Mourinho a £450 bottle of wine from Portugal in a bid to spend time with the Champions League winner. And, while Johnson himself admitted the wine was a "bit of a gimmick", his desire to learn from the best in the world is absolutely genuine. "What I'd like to do with Pep Guardiola is just sit down with a tactics board and thrash out ideas," he told BBC Points West. "When people say 'if I could have dinner with any three or four people...' - well I'd sit down with top coaches and thrash through the thought processes behind certain movements and patterns in the game. "Pep comes across as a very passionate, innovative individual and any coach - old or young - would have to respect what he's done. "Look how quickly he has managed to fast-track Manchester City into one of the best football teams we have ever seen in this country." "The real challenge is going to Oldham on a £900,000-a-year budget," Johnson joked, but added: "I'm sure if that challenge was there, he'd still be able to produce that football and that philosophy." For Johnson, the "real challenge" is not taming Manchester City on Tuesday, but winning promotion to the Premier League. His dad, Cheltenham boss Gary, took the Robins within one win of that feat, losing the 2008 Championship play-off final. "There's still a bit of banter between us, as to who's the most successful Bristol City manager out of us," Gary Johnson told BBC Radio Gloucestershire. "If he gets to the Premier League then that'll be me kicked out the water, but he's doing well and I'm very pleased. "Bristol City looked like a Premier League club in the making that night. It is certainly a club on the move."